Reboot your body with a raw cleanse today. Tired of your old habits? Find easy raw meals to make & like. Resist unhealthy temptations. Get down to your natural weight. Get the raw glow. We all want to create better habits and do right by our bodies, and now is a perfect time. If you've experimented with raw food in the past, you know how good it makes you feel and look. But we could all use a little extra focus and simple tips and tricks to make the right changes that last. Are you ready to see the benefits of a raw cleanse? This cleanse is for you if want to lose extra weight and start making healthy habits that will last all year and give you quick results. This cleanse is perfect if you are busy and looking for maximum impact and results. You want to feel more energetic. You want to look and feel light. You want to lose unwanted weight. You have a busy lifestyle. You'd like to crave healthy foods but don't know how. You want to wake up energized. You want to avoid unwanted weight, health challenges and junk food cravings. This low-fat raw vegan cleanse is for you if want to lose extra weight and start making healthy habits that will last all year and give you quick results. This cleanse is perfect if you are busy and looking for maximum impact and results. In addition to the cleanse, you'll get a unique combination of raw resources to help you easily stick with raw to get the results you want. More than just shopping lists, there are literally dozens of raw resources and benefits included (including integrated video footage of The Rawtarian guiding you along, exclusive easy members-only raw recipes, all of The Rawtarian's ebooks, online courses and guided challenges, handy shopping lists, an optional online community and more) - excellent value here in a wide-variety of formats to suit your busy lifestyle. This no fuss low-fat raw cleanse guides you through 14 days of easy, raw vegan meals for your cleanse. The first week includes seven days of quick low-fat raw food meals with extremely simple low-fat raw vegan low-calorie meal plans. The following seven days include everyday raw foods for a total of 14 days of meal plans and recipes. With this cleanse, you'll eat enough food to last all day and fill you up, but little enough to see results fast. Location and time zone are not important since you can check-in on your schedule. This cleanse is for real people with real lives and limited time in the kitchen. You'll receive Instant access to the cleanse and private community as soon as you register. Bonuses: In addition the cleanse, you'll receive over $900 of valuable bonuses to help you throughout the year. Laura-Jane The Rawtarian is host of The Raw Food Podcast and author of Raw Food Favorites. Her apps, ebooks, videos and resources have helped thousands around the globe transition to a raw food lifestyle. Q: There are a lot of bonuses here. How much will it cost? Get access to the cleanse, plus every recipe, course, ebook and raw resource for just $19.95 per month, cancel anytime. For way less than the cost of a 1-day raw food course, you'll be tapping into the easiest, most satisfying raw food recipes and resources to make your raw journey easier and quicker from the comfort of your own home. Honestly, it’s a no-brainer. Q. Can you take the cleanse, download all the bonuses and then cancel right away? Absolutely. Download and keep what you want, even if you cancel. No questions asked. Q. Can you get a refund if you decide this cleanse isn't for you? Yes, absolutely. The Rawtarian offers a full 100% refund within 30 days. No risk here. Q. What are other people saying about The Rawtarian? Laura-Jane The Rawtarian has been creating raw resources, ebooks and courses since 2009. Below is a tiny selection of the hundreds of emails, testimonials and life-changes she has been a part of. And she'd love to help you take the next step on your raw journey. "I couldn't believe all the choices available and how incredibly easy the recipes were. I've lost 30 pounds and I attribute a lot of that to the ease and variety of following the Rawtarian plan. Thank you Laura-Jane for providing tasty, healthy choices that make the raw lifestyle easier to follow." "I was so frustrated with other raw recipes involving what seemed like 5,000 items! The Rawtarian recipes are elegant and easy. Somehow, I always seem to find myself going back to them in my recipe lists and choosing them over other raw recipes. The video tutorials that come with membership really made me feel excited about preparing the food, and I find Laura-Jane so engaging it's like having a funny, sassy friend in the kitchen with me." "Downloaded the raw recipe package - and quickly made the raw alfredo sauce over zucchini noodles. It was so tasty. I can't believe how much better I feel since taking up the raw lifestyle. Unbelievable!!" "I've been preparing the recipes with ease (thanks to The Rawtarian's simplistic ingredients!) Now that I'm a member and have access to the meal plans, recipes, and videos (which I watch more than TV now days), I have already benefited tremendously." "I made The Rawtarian's raw caramel candies and thought I had died and gone to heaven! Both my husband and my boss LOVED them and have been asking for more. Thank you so much for the easy and delicious recipes." 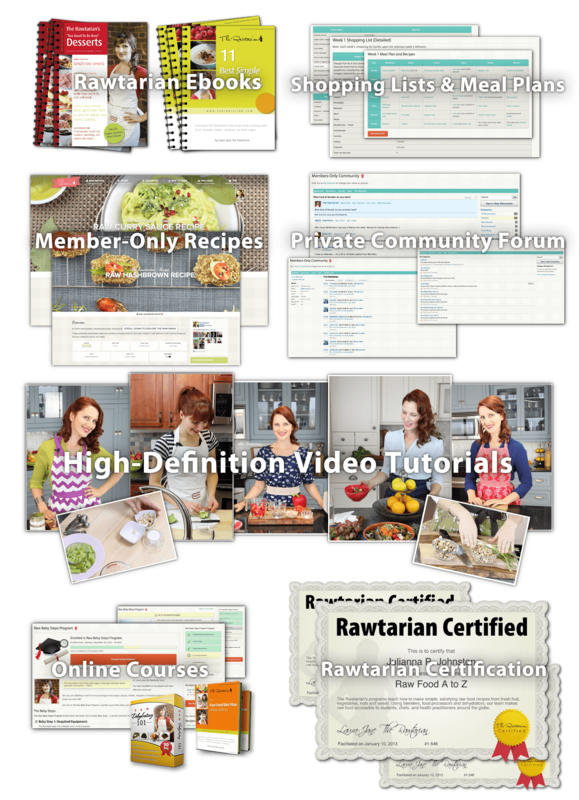 "The Rawtarian website and membership has helped me as I transition to a raw food lifestyle. Laura-Jane's recipes support me and invite family members to eat with me." "Just wanted to pat The Rawtarian on the back and give her a big hug, from one raw foods chef to another. She does great work and inspires people, and we need more like her out there. I love her books." "I struggled for a long time with the viability of going raw, and Laura-Jane The Rawtarian's recipes have made it completely doable and simple, even. Not to mention delicious. I appreciate her being down-to-earth, personable, and really just putting everything she knows out there for all of us to benefit from in a wonderful, captivating format." "When I first started exploring raw foods somehow by great luck I found The Rawtarian. With her fresh and easy approach it is delightful to learn from her. I am eager to keep experimenting with all kinds of dishes. I am wowed by just how easy Laura-Jane makes the process. Watching the member videos really takes the guesswork out of the food preparation procedures plus explaining clearly what ingredients to use." "The Rawtarian's recipes are simple to prepare and as I tried them out I discovered they were DELICIOUS!! I have no desire to eat junk anymore, and I love to prepare her simple and super delicious recipes." Laura-Jane The Rawtarian is a leading creator of simple, satisfying raw food recipes. Laura-Jane is the host of The Raw Food Podcast and has spoken at the BlogHer Food Conference in Miami, FL and the Canadian Food Bloggers Conference in Vancouver, BC. Her recipes have been featured in the National Post newspaper, Vegan Life magazine, and The Huffington Post. Her recipe apps, ebooks and raw-related resources have made raw food easier to incorporate for thousands around the globe. Wondering whether a cleanse can really help you reach your health goals? Register below and take this cleanse totally risk free. Worried that you won't achieve results? Simply cancel within the first month and request a refund to receive 100% of your investment back, guaranteed. No questions asked. Ready for a lighter, more energetic you? You can WIN when it comes to your health. And remember, The Rawtarian offers a full 30-day money-back guarantee. No questions asked. Register for the cleanse now and find out for yourself how transformative raw can be. Cancel anytime and keep the bonuses. $19.95 per month. Cancel anytime.